On Sunday, August 5th, 1 person was killed and 9 others injured after a severe lightning storm rolled over Pocono Raceway in Pennsylvania. The 9 injured in the strike have all, as of Thursday, been released from the hospital. Now, questions are being raised about Pocono Raceway’s liability for their injuries. Lightning kills an average of 58 people a year, and many of those people are simply enjoying the outdoors – there is no fault, just an unfortunate accident. However, some fans are claiming that Pocono Raceway, owned by NASCAR, did not do enough or respond quickly enough to warn fans of the dangerous situation. What the jury must ultimately decide is how much information the track could reasonably be expected to have about the storm, and when. According to reports, a severe thunderstorm warning was issued at 4:12 PM, and the track warned incoming race fans of that prediction via Twitter at 4:21 PM. The race was stopped at 4:43 PM because of the severe storm, and at 4:54 PM, officials declared that the race would be stopped for the day. Lightning struck and killed Brian Zimmerman, who was in the parking lot at his car, at 5:01 PM. Pocono claims that it announced the dangers that day over the loudspeaker; however, many fans have stated, through interviews as well as over Twitter and Facebook, that they did not hear the initial warnings and were not able to take cover quickly enough. According to the Washington Post, a fan tweeted to the Associated Press that the races are so loud you can’t hear the people next to you, much less announcements over loudspeaker. Were the warnings too late? Did Pocono take all reasonable steps to protect the fans? Did the fans take their lives into their own hands when they entered the track that day? NASCAR has so far declined to comment on their legal liability, but a memorial fund has been set up for victim Brian Zimmerman and his family. In addition, NASCAR tracks are required, according to their agreements with Dover Motorsports, to have $50 million in insurance to cover spectator injuries. If one or more of the victims decide to file personal injury claims, the litigation will be very complex. There is nothing straightforward about a business’s liability in personal injury claims, because fault is unclear. Regardless, if you have been injured on personal or business property and you think your injury might have been caused by negligence, it is important to speak to an experienced personal injury lawyer right away. 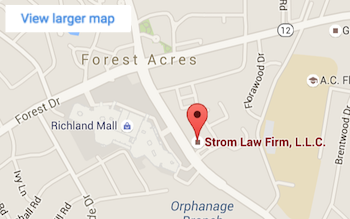 The lawyers at Strom Law, LLC specialize in personal injury litigation, and we offer free consultations to help you get on the right path. 803.252.4800.